The Color of Daily Life: Majolica Pottery by ceramic artist Linda Arbuckle is on display in the Southern Utah Museum of Art (SUMA) through February 28. 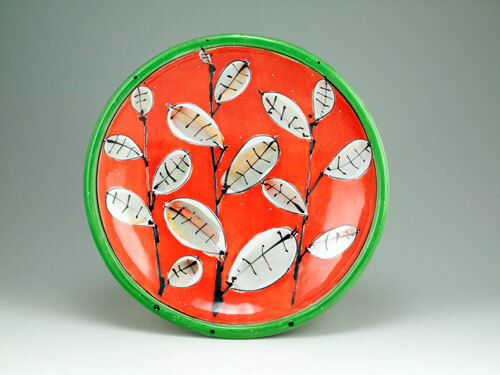 All of her ceramic pieces are created using majolica glaze on terracotta clay. Arbuckle will be at the museum for the SUU Art & Design Department’s Art Insights series on February 9 at 7:00 p.m. Her presentation will discuss how to design pottery surfaces. Admission to both the museum and Art Insights is free and open to the general public. Growing up in a 50’s-style housing development where all the houses looked the same, Arbuckle quickly learned how to create items from household goods to customize her environment. This creative spark fueled her desire to study art. She received her BFA in Ceramics with a minor in Photography from the Cleveland Institute of Art and an MFA in Ceramics from the Rhode Island School of Design. Arbuckle has been a professor of ceramics at Louisiana State University and the University of Florida and is currently the Professor Emerita of Ceramics for the School of Art and Art History at the University of Florida. Her exquisite artwork has been featured in juried shows, festivals, workshops and lectures across the United States. Arbuckle describes her artistic work as functional pottery that is made to engage the user in a fun, playful way in everyday life. Her pieces are often indulgent in the amount of decoration and color due to her belief that daily life is the ground zero of values and meaning. She finds inspiration for her designs from diverse sources: nature; plants; Japanese crafts, such as kimonos and baskets; textile prints; fashion magazines; historic and popular culture; and other artists, especially Japanese artists Hiroshige and Hokusai. Susan Harris, acclaimed ceramic artist and Professor of Art at SUU, first became acquainted with Arbuckle when they were both board members on the National Council on Education for the Ceramic Arts. Since then, they have become old friends, sharing art. Harris invited Arbuckle to present at SUU because she is the best-known and widely understood to be the premier ceramic artist in the United States that uses majolica techniques in her work. For more information about Linda Arbuckle or to view how she creates her stunning pieces of art, visit her website at http://lindaarbuckle.com/.